An oddly shaped yard needs -- and gets -- a special outdoor living space. 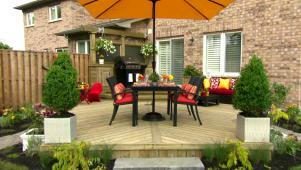 Paul's design optimizes a large, empty yard and creates a relaxing space. 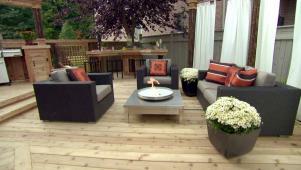 Paul's design proves that a deck doesn't have to be big to be impressive. White trim adds sleek, clean lines to a multipurpose outdoor living space. A graceful curved deck extends the house and gives access to the backyard. 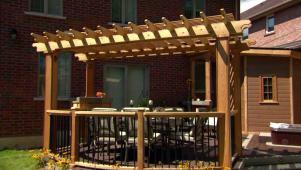 Paul and the crew repair, replace and redesign a welcoming waterfront deck. proves any backyard can be the main attraction. Busy parents of two active kids want a true backyard oasis for the adults to enjoy. 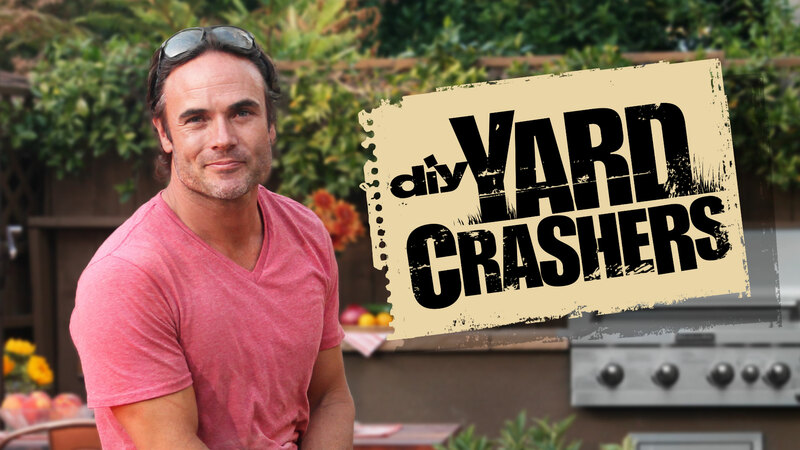 Going all in, they enlist Paul to completely remake their entire backyard! The makeover includes a unique circular island deck surrounded by waterfalls and a moat and a complete outdoor kitchen and dining zone. With a pergola topped by shade sails and backed by decorative privacy screens, this deck provides a truly exotic escape from its suburban setting. With an awesome backyard swimming pool, Anita and Ken decide to finally upgrade the tired concrete patio that surrounds it. Paul dives headfirst into this deck build and creates two connected areas, an upper lounge zone with a fire table and a trio of waterfalls that cascade into the pool, and a lower dining zone complete with a harvest table and outdoor kitchen. Anita and Ken can finally escape the sweltering summer sun under the shade slats and retractable awning of their awesome new poolside retreat. Darren and Delaine desperately want their backyard to accommodate their four children and large extended family but realize their scattered collection of lawn furniture is not cutting it. Faced with a rare pie-shaped lot, Paul goes all out with a creative semicircle design that includes chunky cedar beams and overhead awnings that enhance the deck's outdoor amphitheater feel. There's a comfy lounge zone, a built-in barbecue with a stone-clad base, a central waterfall and a sun-lounging zone. Darren and Delaine can finally entertain their relatives in style! Selmin and Yasmin want to fill in their massive empty backyard with a deck big enough to accommodate their huge extended family. They also have an interesting request for Paul, create enough privacy so Yasmin can enjoy the outdoors without wearing her traditional headscarf. Paul's really into this one and builds a two-tiered deck. The first story level has three separate lounge zones that are completely sheltered from the rain and surrounded by retractable mesh screens to keep the bugs out. The second-story level has decorative privacy screens and a curved, translucent polycarbonate pergola that covers a dining zone and barbecue. 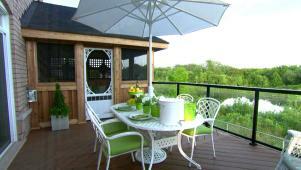 This deck has a ton of style and privacy, and is truly one of a kind. What do you do when you have a West Coast woman who misses home? You bring home to her backyard. In this incredible episode Paul builds a backyard deck that feels like a ski chalet in the mountains. This deck has everything including a circular pergola with a curved couch that surrounds a fire feature - perfect for cold nights sipping hot chocolate. After ten years of living with an empty backyard, Kenneth and Tutran realize it's time to turn their backyard patch of grass into a family escape. With two young children, they want their deck to be multi-faceted, enough space for the adults to entertain, but also with a shaded place to relax as they watch the kids play. Paul comes up with a three-deck layout that includes a dining zone with a covered BBQ, a central lounge deck with curved cedar beams and a retractable awning, and a secondary lounge area to soak up the sun. 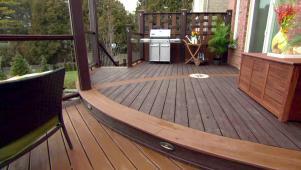 There is plenty of room on this innovative deck for Kenneth and Tutran's young family to grow into. 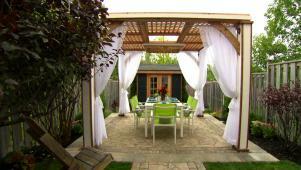 A young urban couple with two young daughters, Ileana and Lawrence want both beauty and function in their backyard. 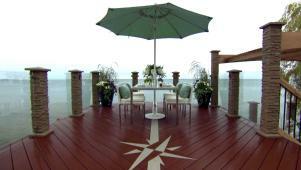 Paul designs a modern deck with a perfect blend of the two. A massive BBQ nestled in a marble countertop sits on the upper level beside a dining zone, and curved stairs lead down to the yard and children's play structure. The lower lounge zone is surfaced in an elegant stone, and is joined to the upper level by a see-through outdoor fireplace. Ileana and Lawrence can enjoy their new urban escape relaxing under towering stainless steel beams and hidden by cedar privacy screens. 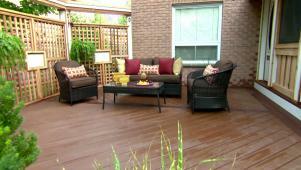 No one likes maintaining a deck, and Cheryl and Andrew are proof of that! They want to replace their rotting cedar deck with a low-maintenance version that has all the fixings. Paul's got the perfect solution, a deck surfaced completely in stone! This one's got a ton of add-ons: a massive hot tub, a covered barbecue connected to the house by a heated walkway, a fire table, a water feature and, finally, backlit translucent stone privacy screens! Not only will Cheryl and Andrew have practically no maintenance to do, they can also spend all of their free time relaxing on their luxurious new deck.